I think this was covered at the old MBO, but I have to ask again. We had a big storm come through last weekend and we lost a couple of sections of the dock. As it is wood and quite old, we are thinking of replacing the entire thing, along with making it bigger. Has anybody here used some of the new composite decking like Trex? The idea of no slivers and no maintance sounds good to me. Does it work as advertised? Absolutely. No splinters, no rotting, no maintenance. There are dozens of different brands, colors, and textures. Some look amazingly like real wood. Don't get a dark color for your dock though...it will get really hot in the sun. And the fasteners generally will sink into the material and not even show. Pretty cool. 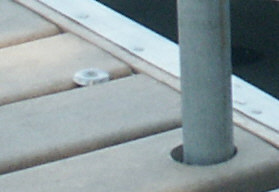 I had light grey Trex decking on my old dock. It was GREAT. Good stuff...Trex or Classis is what the dock builders around here use. I installed a new dock last year with TREX. I absolutely love it. All the edges are rounded.... so never ever a chance of splinters. No warpage. It's textured, so no slippage... even when wet. Although there were several colours, I picked the light sandy color.... that fades to look like aged cedar. The downside is that it is heavy. My dock is 6' wide. They pre-assemble the dock pieces into sets of 4 to make a 2' "pallet". Each "pallet" weighs about 75 pounds. They then lock each "pallet" down with screw clips. 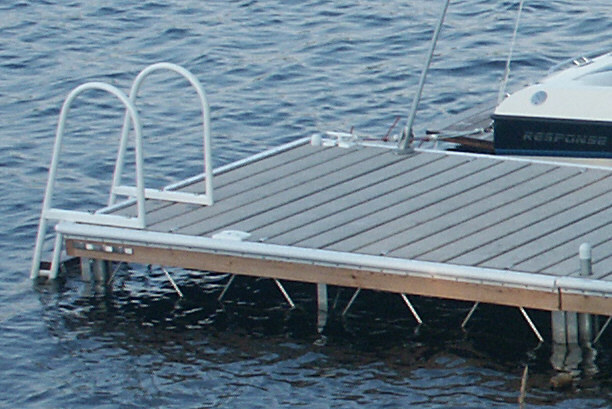 The good part of the weight is that the dock ends up being very heavy/stable. My brother-in-law just bought the same dock frame.... but used cedar. Cost is roughly the same. Although it's brand new, he's already having to replace a few of the cedar boards. I'd never go back to cedar now that I've used the composite material. See how smooth the edges are! Here's a (lousy) shot of the little clips you add to keep each pallet secured. Nothing to stub toes on! doug, i am in the middle of this now. quick question about the cleats. on my current pressure treated setup, the cleats are attached directly to the 2 X 4s. Can the same be done with the trex, or do you have to use special ones, along with some type of backing? AFAIK, my cleats were secured directly to the TREX. re Cleats: You can see in the upper left part of this picture how I have attached the "Dock Edge" cleats to the TREX Decking..... however, I thru-hole drilled right into the aluminum channel underneath that the TREX pallets sit on. So.... there is no worry about bolts pulling through. I used bolts and nuts.... NOT screws. When I installed the ladder, I couldn't line up all the ladder holes to go through the aluminum channel underneath. Likewise, the mooring whip base had a 3rd hole that just went through the TREX.... no supportinmg aluminum channel underneath. In BOTH these cases, I used very LARGE flat washers underneath the TREX to support the nut. Thanks for the photos. I'm sold!! I'm going to start making calls today. Thanks for the help. Dave, where are you located? I know a local dealer personally that sells Trex. You're welcome! You'll love it! I'm in Michigan. The dock is in Southwest Michigan. Your welcome. Glad to provide input that might help. One last (sad) photo. This is the depressing day in the fall just before I disassemble and float/pull the 3 dock sections in to shore. actually, i know what i will end up with. i got all my permits today!! to redo my old dock. 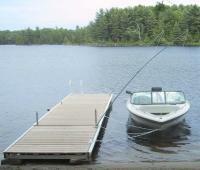 i am replacing 3 floating sections that are very narrow and unstable, with one 8' X 20' float. there will be 4 large piles (telephone pole size) that will be installed to hold it in place. a ramp will come down from the fixed sections. i live on a ocean/spring fed river, so it is tidal. it also does freeze, so an ice eater will run in the cold months (currently i remove the smaller sections, but it won't be feasible with this large section). a come-along will be used to lift it slightly, but the ice eater will do the job (all the newer docks in the area use them without problems). my last decision was on decking material. PT, Mahogeny (which one of my neighbors used and it is beautiful, but the maintenance might be a nightmare) or the trex. I will go with the trex. i will post picks when complete (probably sometime in july). No prob man. FWIW, another popular dock material down here in coastal SC is called Ipe (pronounced eepay) - aka. brazillian ironwood. It is one of the most desne woods available and is very low maintenance and very hard. It is said to last over 25 years. Here is how I spent my summer vacation (well, one week of it, anyway). I built all the fixed section after the piling guys drove the pilings. I also had them build and float down the float section, because their price was only a little more than just my material costs alone. For some reason their total cost was outrageous for the fixed section, so i did all the manual labor on that part. Saved several thousand dollars this way. 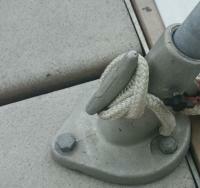 I ended up using WeatherGuard for Docks, the material all the dock builders around here use. It is supposedly better than Trex (it better be, it was a LOT more money). All looks very nice! Job well done!! I noticed the hose, do you spray the boat down after every outing?